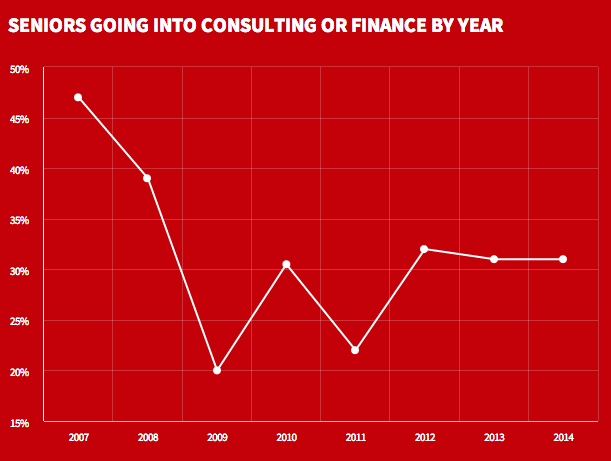 Every now and then I look at the statistics for this blog. My rough estimate is that there is a core group of at least several thousand who read it regularly (i.e., a few times per week or more), and typical posts are eventually read by ~ 10 thousand people or more. I know very little about my readers, hence this survey. Answer whichever parts you like and paste into the comments. Many thanks! 1. Age, gender, ethnicity, nationality? 2. What's your background (education, profession, hobbies)? 3. What do you like best about this blog? 4. What do you like least about this blog? 5. How often do you find posts hard to understand? 6. Have we met in real life? Should we? I can guess that there are several overlapping subgroups of readers: physicists, genomicists, financiers, tech / startup types, professors, ... But I'd really like to know more! 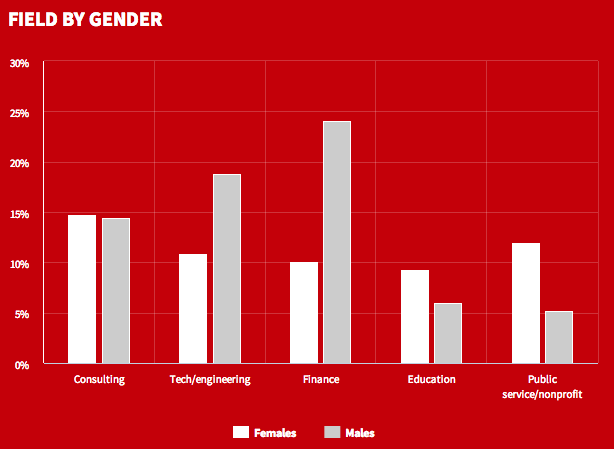 Harvard senior survey conducted by the Crimson. Figure shows metabolic difference in various tissue types for 4 species; PFC = Prefrontal Cortex. Human brain function accounts for about 20% of total calorie consumption. See also Cognition über alles and The genetics of humanness. Metabolite concentrations reflect the physiological states of tissues and cells. However, the role of metabolic changes in species evolution is currently unknown. Here, we present a study of metabolome evolution conducted in three brain regions and two non-neural tissues from humans, chimpanzees, macaque monkeys, and mice based on over 10,000 hydrophilic compounds. 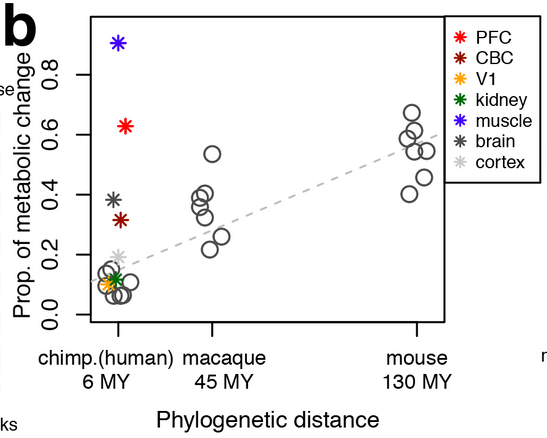 While chimpanzee, macaque, and mouse metabolomes diverge following the genetic distances among species, we detect remarkable acceleration of metabolome evolution in human prefrontal cortex and skeletal muscle affecting neural and energy metabolism pathways. These metabolic changes could not be attributed to environmental conditions and were confirmed against the expression of their corresponding enzymes. We further conducted muscle strength tests in humans, chimpanzees, and macaques. The results suggest that, while humans are characterized by superior cognition, their muscular performance might be markedly inferior to that of chimpanzees and macaque monkeys. Physiological processes that maintain our tissues' functionality involve the generation of multiple products and intermediates known as metabolites—small molecules with a weight of less than 1,500 Daltons. Changes in concentrations of these metabolites are thought to be closely related to changes in phenotype. Here, we assessed concentrations of more than 10,000 metabolites in three brain regions and two non-neural tissues (skeletal muscle and kidney) of humans, chimpanzees, macaque monkeys, and mice using mass spectrometry-based approaches. We found that the evolution of the metabolome largely reflects genetic divergence between species and is not greatly affected by environmental factors. In the human lineage, however, we observed an exceptional acceleration of metabolome evolution in the prefrontal cortical region of the brain and in skeletal muscle. Based on additional behavioral tests, we further show that metabolic changes in human muscle seem to be paralleled by a drastic reduction in muscle strength. The observed rapid metabolic changes in brain and muscle, together with the unique human cognitive skills and low muscle performance, might reflect parallel mechanisms in human evolution. Nice article on the progress of computer Go. ... Good opens the article by suggesting that Go is inherently superior to all other strategy games, an opinion shared by pretty much every Go player I’ve met. “There is chess in the western world, but Go is incomparably more subtle and intellectual,” says South Korean Lee Sedol, perhaps the greatest living Go player and one of a handful who make over seven figures a year in prize money. Subtlety, of course, is subjective. 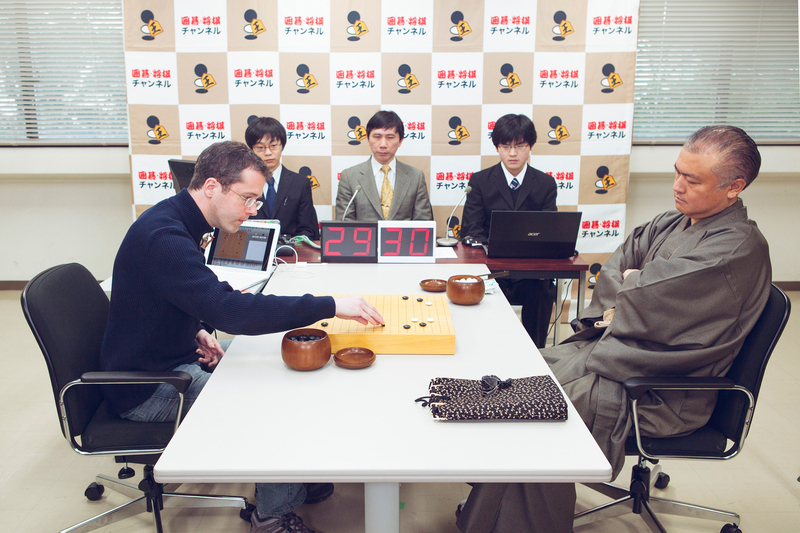 But the fact is that of all the world’s deterministic perfect information games — tic-tac-toe, chess, checkers, Othello, xiangqi, shogi — Go is the only one in which computers don’t stand a chance against humans. The current handicap accorded a computer against a professional player is 4 stones. In the story below the world chess champion and his brother are given 9 stones by the Japanese mathematician (shodan = lowest non-beginner or black belt). Mr. Kitabatake one day told us that a Japanese mathematician was going to pass through Berlin on his way to London, and if we wanted to we could play a game with him at the Japanese Club. Dr. Lasker asked him whether he and I could perhaps play a game with him in consultation, and was wondering whether the master – he was a shodan – would give us a handicap. “Well, of course,” said Mr. Kitabatake. “How many stones do you think he would give us?" asked Lasker. 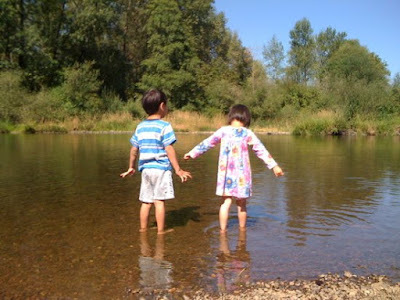 “Nine stones, naturally,” replied Mr. Kitabatake. “You will see,” he said. The great day came when we were invited to the Japanese Club and met the master – I remember to this day how impressed I was by his technique – he actually spotted us nine stones, and we consulted on every move, playing very carefully. We were a little disconcerted by the speed with which the master responded to our deepest combinations. He never took more than a fraction of second. We were beaten so badly at the end, that Emanuel Lasker was quite heartbroken. On the way home he told me we must go to Japan and play with the masters there, then we would quickly improve and be able to play them on even terms. I doubted that very strongly, but I agreed that I was going to try to find a way to make the trip. This is an old story I told the kids. 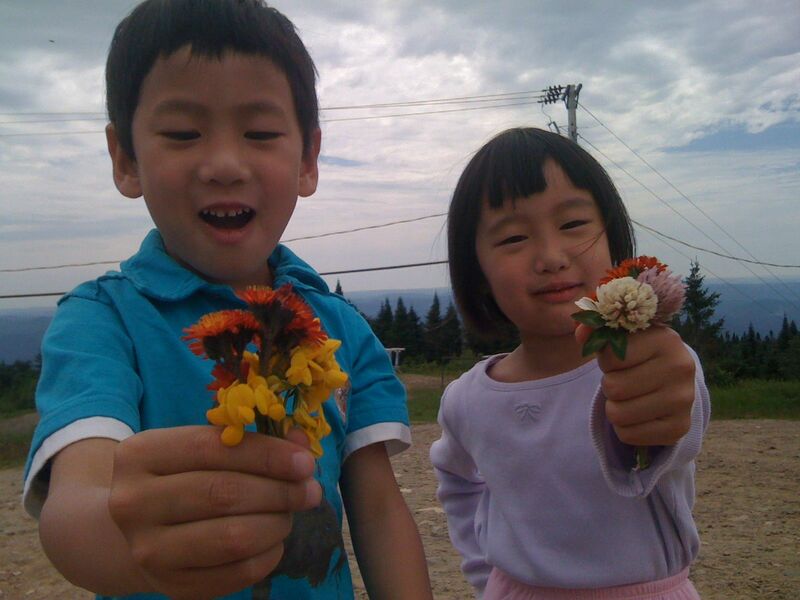 One day Max and Isabel were hiking in the mountains and came upon a cave. Exploring in the gloom, they found a giant cavern, filled by a pile of gold and jewels. Atop the pile was a huge throne. On that throne sat the dwarf king. Who dares enter my throne room? asked the dwarf king. My name is Isabel and this is my brother Max. You sure have a lot of gold, said Max. Yes, said the dwarf king with a gleam in his eye. I am the richest in the world! What use are riches in this dark cave? asked Max. What?!? I am the richest in the world!! Oh dwarf king, said Isabel, no hoard of gold is worth even a single flower, growing in the summer sun. Great interview with former Olympian (freestyle) Dan Cormier after he submitted another Olympian (greco) Dan Henderson at UFC 173 last night. I believe Cormier can beat Jon Jones. Cormier is only about 5"10 whereas Jones is 6"4 (both fighting at 205). Previous fighters have been forced by Jones to play his striking / top control game. But Cormier is smart -- he didn't get into striking exchanges with Henderson, who has a dangerous right hand. He kept the fight on the ground and dominated from the top. He can do the same to Jones. Using this strategy, he can use Jones's length against him -- we'll see Jon Jones fighting off his back for the first time. What I like about Cormier is that he is really developing his jiujitsu. Many wrestlers are unable to capitalize on top position due to lack of high level submission skills. I'm not a materialistic guy, but I do like modern architecture. My eyes nearly popped out when I saw this photo in Dwell. The house is in the Hollywood Hills and the view is of downtown LA. The anthropologist Ashley Montagu advanced the idea that race is a social construct rather than a biological reality. For Wade, Montagu is a foil against which to benchmark recent advances in human genomics. Wade: ... So I decided that I would write a book that explained what we know about race and what the consequences might be, and I think Montagu made a terrible mistake, though I share his motives. Note the discussion below avoids using the term "race" and focuses instead on groups of humans that share ancestry. The degree of sharing can now be directly measured through genotypes. Two modern humans differ at about 1 in 1000 loci (out of ~ 3 billion in the human genome). There are a few million differences between any two individuals across their entire genome. A common argument is that 99.9 percent genetic similarity cannot leave room for "consequential" differences. But modern humans and Neanderthals are almost as similar (~ 99.8 percent; we have high accuracy sequences now for Neanderthals), and there are significant differences between us and them: both physical and cognitive. However, because humans and Neanderthals are known to have interbred, we are still part of the same species. (Would it be fair to refer to them as a separate "race"? Is the modern-Neanderthal difference merely a social construct?) Furthermore, this 0.1 percent genetic variation accounts for human diversity encompassing Confucious, Einstein, Shaq and Shakespeare. Genetic variation is patterned -- two individuals who trace their ancestry to the same geographical region (e.g., two Japanese) will have about 15 percent fewer total differences between them than if we were to compare individuals from widely separated ancestries (e.g., a Nigerian and a Japanese). This means hundreds of thousands of fewer differences between individuals from the same group than for two randomly selected people from different groups. Gene variants (alleles) which are common in one population (e.g., 90 percent of Japanese have version A) can be rare in another (e.g., only 20 percent of Nigerians have version A). Differences in allele frequencies are correlated across populations. From these correlations one can easily identify a genome (or even a small chunk of DNA as long as it includes many alleles) as belonging to a particular ancestral group. To oversimplify: just ask whether the DNA chunk in question has mostly the variants that are common in one group as opposed to another. Even if the differences in allele frequency are small -- e.g., allele X is 62 percent likely in Japanese, versus 57 percent likely in Nigerians -- once we consider thousands of such alleles the statistical signal becomes apparent. Each individual (or chunk of DNA) can be associated with a particular ancestral group. Is this genetic difference consequential? Does it make two Nigerians more similar, on average, to each other than to a random European? Obviously, on some superficial phenotypes such as skin color or nose shape, the answer is yes. But what about more complicated traits, such as height or cognitive ability or personality? All of these are known to be significantly heritable, through twin and adoption studies, as well as more modern methods. We can't answer the question without understanding the specific genetic architecture of the trait. For example, are alleles that slightly increase height more common in one group than another? We need to know exactly which alleles affect height... But this is challenging as the traits I listed are almost certainly controlled by hundreds or thousands of genes. Could population averages on these traits differ between groups, due to differences in allele frequencies? I know of no argument, taking into account the information above, showing that they could not. Many who argue on Montagu's side hold the prior belief that the ~ 50k years of isolation between continental populations is not enough time for differential selection to produce group differences, particularly in complex traits governed by many loci. This is of course a quantitative question depending on strength of selection in different environments. The new results on height should cause them to reconsider their priors. It is fair to say that results on height, as well as on simpler traits such as lactose or altitude tolerance, are consistent with Wade's theme that evolution has been recent, copious, and regional. 2) There is no a priori argument, given what we currently know, that such differences cannot exist. (Cf. Neanderthals!) Note this is NOT an argument that differences exist -- merely that they might, and that we cannot exclude the possibility. The second part of A Troublesome Inheritance covers controversial topics such as genetic group differences in behavioral and cognitive predispositions, and their societal implications. Wade is mostly careful to present these as speculative hypotheses, but nevertheless his advocacy leaves him vulnerable to easy attack. What I have summarized above are the incontestable (albeit, in some circles, perhaps still controversial and poorly understood) new results that have accumulated through the last decade of genomic research. See also Recent human evolution: European height and The Neanderthal Problem. Note Added: Distinguished evolutionary biologist H. Allen Orr has written a review in The New York Review of Books which I find quite similar to mine. There was some back and forth between Razib Khan, Orr and Jerry Coyne. I added the comment below. My take on the book is similar to that of Orr/Coyne: does a decent job of explaining population structure; too much speculation in the second part. However, I think Orr/Coyne/Wade all miss the most interesting piece of science regarding strength of recent selection: evidence that the N-S height gradient (about 1 SD of difference between the two regions) in Europeans is due to selection pressure. That would constitute an example of fairly strong (in the context of the debate over group differences in humans) selection pressure acting over relatively short periods of time (~ 10 kya or less). I would think this result, if it holds up, might require significant updating of priors for certain people. It also provides a good example of how science in this area should be done: observed phenotype group difference, large data sets (GIANT) teasing out the genetic architecture, tests for selection on associated genetic variants. Another point, for the cognoscenti: Wade does a good job explaining the difference between soft and hard sweeps. Orr notes that small adjustments of allele frequencies is one of the primary mechanisms for evolutionary change (so nothing new in Wade’s discussion; goes all the way back to Fisher), but many many readers, even biologists who aren’t in population genetics, don’t understand this point very well. So reading that section in the book would increase understanding for a large number of people. Here are two nice figures I came across recently. 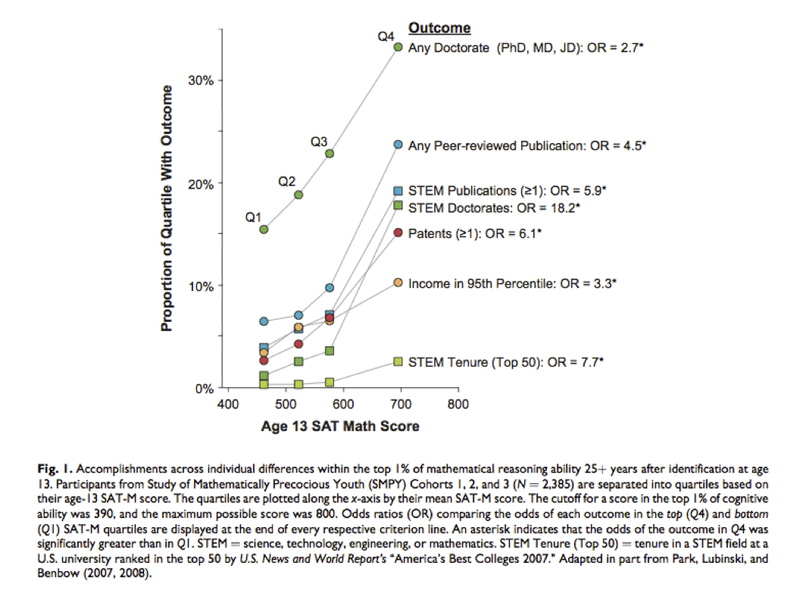 The first, based on SMPY data, displays odds ratios for various accomplishments (doctorate degree, STEM publication, patent, high income, tenure) as a function of SAT-M score at age 13. The quartiles correspond roughly to 1 in 200 ability (Q1) to 1 in 10k ability (Q4). 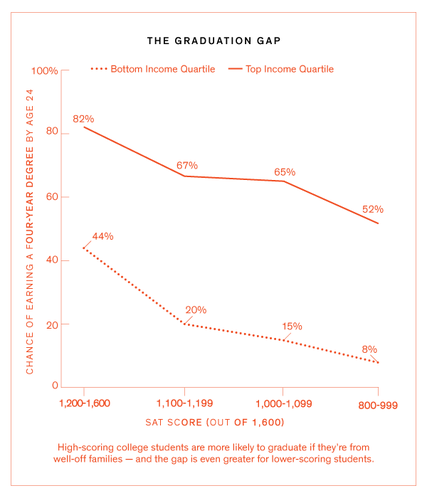 This data soundly refutes the "IQ above 120 doesn't matter" Malcolm Gladwell nonsense. See earlier post Horsepower matters; Psychometrics works. 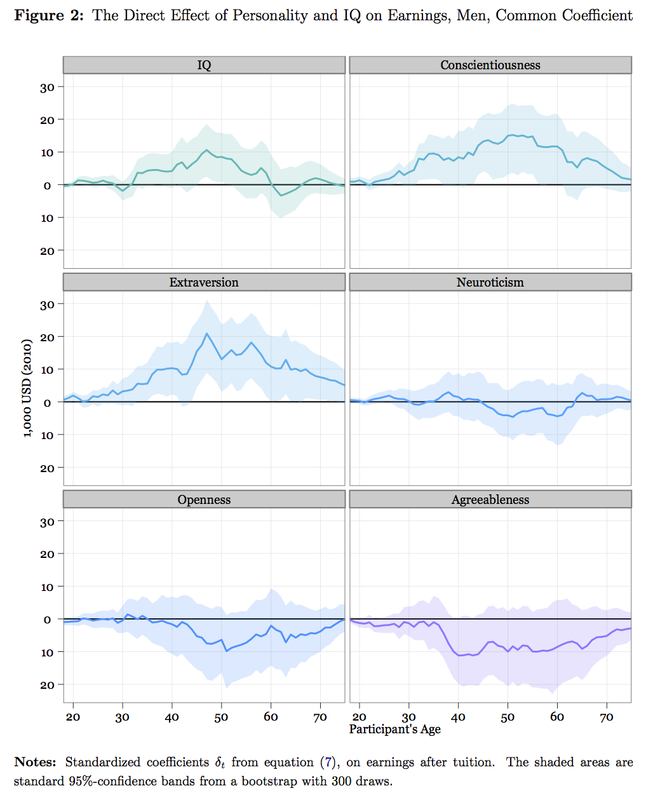 The second figure shows regression coefficients of income (at various ages) vs IQ and personality traits (standardized, so returns for each SD of trait). This was originally discussed in Earnings effects of personality, education and IQ for the gifted; see also this paper (Miriam Gensowski, Copenhagen). Note the IQ returns may be underestimated for average individuals since the data source is Terman and there is significant restriction of range (everyone tested at better than 1 in 200 or so on the Stanford-Binet). Nevertheless there are still positive returns to above average IQ within the Terman group (analogous to SMPY results above). Some interesting examples of shared environmental effects on height. The more kids there were in a household, the shorter they were: Not only because there was less food to go around, but also because it made it more likely that there were more people in each bedroom. “Crowding can help spread respiratory and gastrointestinal infections,” Hatton said. “People sneezing on each other, that sort of thing.” Each additional sibling cost the men an eighth of an inch, and having more than one person per bedroom shaved off a quarter-inch. Children of literate mothers were taller: When mothers couldn’t read, they were less likely to know about the importance of a balanced diet or clean cutlery. The researchers measured the percentage of women by region who were only able to sign their marriage certificates with an X, rather than their name. People from areas with a high percentage of illiterate mothers were a quarter-inch shorter. People from industrial districts were shorter than those from agricultural areas: Regardless of income, the Dickensian living conditions of 19th century British cities suppressed height by about nine-tenths of an inch. Average European male height increased 11 centimeters between 1870 and 1970, about a centimeter per decade, or 1.5 SD in a century. Seems suspiciously similar to the Flynn Effect! In addition, over the same period of time average years of schooling went up significantly: e.g., UK 1870 4 years to 1930 7 years (see Appendix A of this paper). Most individuals born 100 years ago experienced significant deprivation by modern standards. My own view is that there is nothing particularly mysterious about the Flynn Effect: living conditions, nutrition, and availability of education have all improved drastically in the last 150 years. So g scores should have as well. The Flynn Effect can be consistent with high heritability for non-deprived individuals in modern environments. See also Swedish height in the 20th century and Flynn on the Flynn Effect. The north-south gradient in average height found in Europe (see figure) may be a consequence of differential selection pressures that vary by region. I recommend this podcast interview with Michael Lewis (Longform.org). As with other Longform interviews, it focuses on his work/career as a writer and journalist. Flash Boys is only mentioned in passing. Leonard Lopate interviews Nicholas Wade (veteran genetics correspondent for the NYTimes) about his new book A Troublesome Inheritance: Genes, Race and Human History. The interview is slow at first but the second half is good. Update: Another interview (May 9), with CBC, that gets right to the point regarding "social construction" -- the convenient but incorrect legacy of anthropologist Ashley Montagu (Israel Ehrenberg). The second guest, Stanford anthropologist Duana Fullwiley, foreshadows the counterattack on Wade. See also this well-written essay in Time, adapted from the book. (1) The first part of the book covers well-established science concerning the genetic clustering of human populations. Some of the results will be surprising to those who have not followed the last 10 years of progress in genomics. See, e.g., here and here for my thoughts on this subject. (2) The second part of the book covers controversial topics such as genetic group differences in behavioral and cognitive predispositions. Wade is mostly careful to present these as speculative hypotheses, but nevertheless his advocacy leaves him vulnerable to easy attack. It will be interesting to see how this book, by a prominent science writer (indeed, the chief genetics correspondent for the paper of record), is received by the intelligentsia, the punditocracy, and actual scientists. Below I have excerpted from the first link in (1) above, a post I originally wrote in 2007. I think these remarks are quite relevant to Wade's new book; note specific comments in brackets [ ... ]. Hypothesis 1: (the PC mantra) The only group differences that exist between the clusters (races) are innocuous and superficial, for example related to skin color, hair color, body type, etc. Hypothesis 2: (the dangerous one) Group differences exist which might affect important (let us say, deep rather than superficial) and measurable characteristics, such as cognitive abilities, personality, athletic prowess, etc. ... As scientists, we don't know whether H1 or H2 is correct, but given the revolution in biotechnology, we will eventually. Let me reiterate, before someone labels me a racist: we don't know with high confidence whether H1 or H2 is correct. I lived on the mixture, more or less, for a three-day weekend. Many of the tips I’d heard proved true. Soylent tastes better when it’s been in the fridge overnight. (A D.I.Y. user told me that this is “because the ingredients have been able to congeal.”) It’s more appealing after physical activity—when you’re hungry, you find that you actually crave it. The smell is a downside. On Friday, after a few hours, the doughy fragrance seemed to be everywhere—in my mouth, on my breath, my fingers, and my face. And the stomach takes a while to adjust to liquid food: by the afternoon, I felt like a walking water balloon. Living on Soylent has its benefits, though. As Rhinehart puts it, you “cruise” through the day. If you’re in a groove at your computer, and feel a hunger pang, you don’t have to stop for lunch. Your energy levels stay consistent: “There’s no afternoon crash, no post-burrito coma.” Afternoons can be just as productive as mornings. But that is Soylent’s downside, too. You begin to realize how much of your day revolves around food. Meals provide punctuation to our lives: we’re constantly recovering from them, anticipating them, riding the emotional ups and downs of a good or a bad sandwich. With a bottle of Soylent on your desk, time stretches before you, featureless and a little sad. On Saturday, I woke up and sipped a glass of Soylent. What to do? Breakfast wasn’t an issue. Neither was lunch. I had work to do, but I didn’t want to do it, so I went out for coffee. On the way there, I passed my neighborhood bagel place, where I saw someone ordering my usual breakfast: a bagel with butter. I watched with envy. I wasn’t hungry, and I knew that I was better off than the bagel eater: the Soylent was cheaper, and it had provided me with fewer empty calories and much better nutrition. Buttered bagels aren’t even that great; I shouldn’t be eating them. But Soylent makes you realize how many daily indulgences we allow ourselves in the name of sustenance. This was released in 1980 and includes interviews with Rabi, Ulam, Bethe, Frank Oppenheimer, Robert Wilson, and Dyson.